Yes, we made it again! Spaces summit 2018 – the bol.com IT conference by engineers, for engineers – happened again last 7th of June, on the hot summer day in our home town Utrecht. 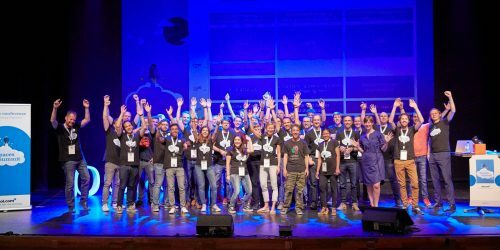 The event brought together more than 340 participants from bol.com, Ah.nl, Google, as well as students from different Universities that were also invited. While videos, sketchnotes (yes, we have talented and experienced sketchnotes makers in house) and slide decks from this event are being prepared for the following posts, here is a brief summary. The day started with the registration process, carefully executed by our team managers. Then followed opening by Jurrie van Rooijen, bol.com IT Director, and keynote from Google. And after that the regular talks started in three parallel sessions. Some talks were on non IT subjects: how to get more concentration, human friendly explanation of Gravitation Waves and how Lean User Experience can be landed on Agile frameworks. During the breaks in between the talks you could try VR glasses and a blockchain mining arcade machine in the lobby. Speakers, besides healthy portion of adrenaline and questions got small rewards afterwards. Last but not least, there was a team poster competition: teams presented themselves and the team with the best poster got a prize in the end of the day during drinks. Of course we are nowhere close to the scale of WWDC or Google IO, but a thousand mile journey starts from a single step. Want some more specifics? Check out our Techlab channel for all presentations.